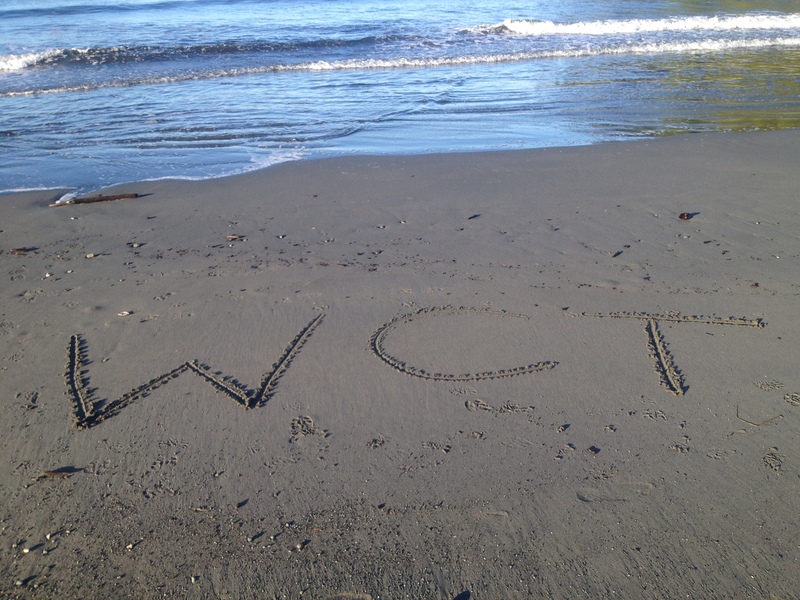 Anyone planning to hike the WCT should be prepared to face an extremely technical and challenging trail. The number of ladders you need to climb up and down alone with a 40 or more pound pack means you need to have a decent fitness level before starting and good strength. This is definitely not a trail for beginner hikers. 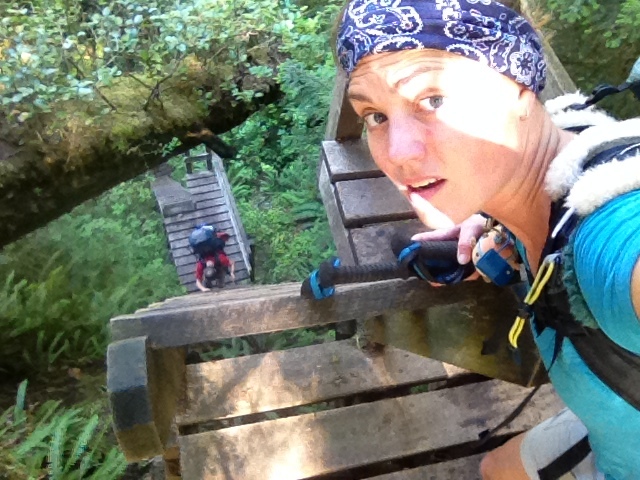 Balancing on logs, boulders and roots makes every step of the trail near death-defying. In the rain the challenge and abundance of mud is only magnified. Be prepared that some kilometres will take up to one hour to hike. What gear is necessary to hike the trail? You can refer to my Gear & Clothing list, but I would highly encourage hiking poles for balance alone, as well as high gaiters if you want to prevent your legs from being covered in mud as well as waterproof boots or shoes. I did it with non-waterproof shoes and low gaiters but I experienced no rain and the mud was probably as good as it’s ever going to get after a sunny summer. Pack as light as you possibly can considering you’re climbing rocks and ladders with your pack on your back and having to dead lift it on many occasions. My pack weighed approx. 40 pounds with five days of food and 2 litres of water. If you are driving yourself you will need to decide whether you park where you want to start or finish. 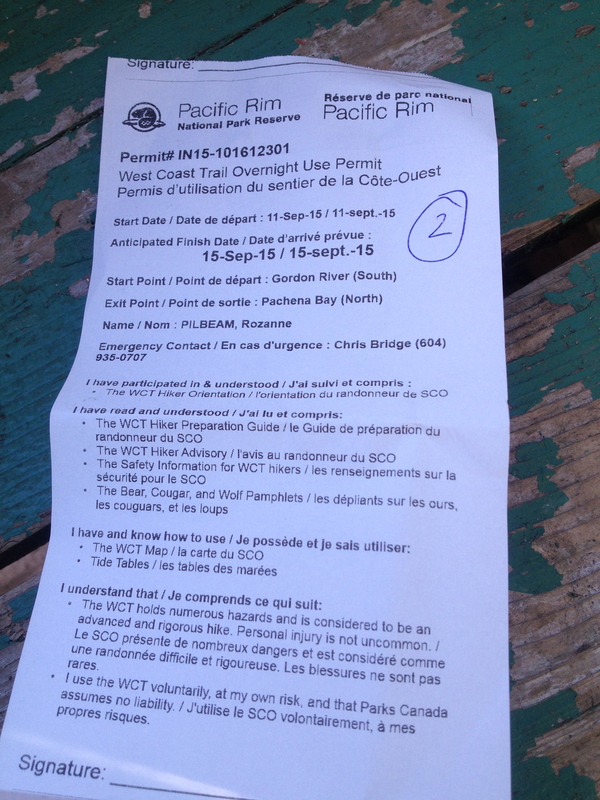 If you park where you start you will need to catch the bus at the end of your hike back to the start point and time your trip as per the bus timetable (check out the West Coast Trail Express website). If you park where you finish the hike you can catch the bus to the other end of the trail and have your car waiting when you finish (highly recommended). 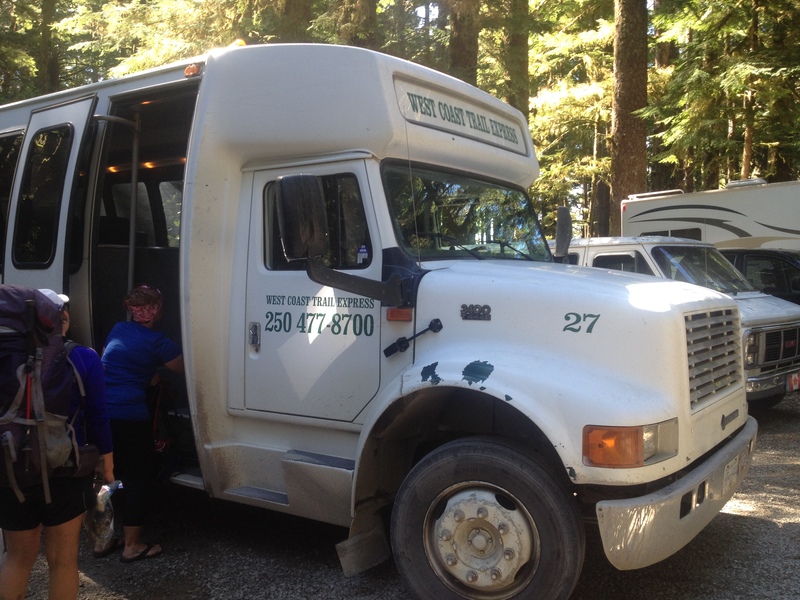 You can also catch the bus all the way from Victoria or Nanaimo to your chosen trailhead. Nobo or Sobo (northbound or southbound)? 1. 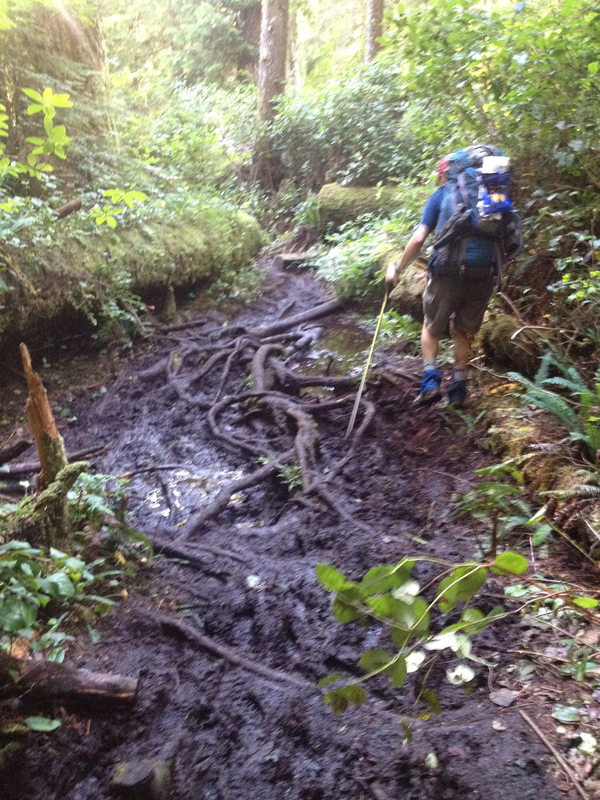 The most challenging section is from Walbran Creek (km 53) to the southern trailhead at Gordon River (km 75). I would want to tackle this with fresh legs and have it out of the way so you can enjoy the rest of the trip, as opposed to hearing horror stories from every northbound hiker you pass. I don’t agree with the reasoning that your pack will be lighter at the end. Sure it will, but your body will have half the strength to lift it. 2. The small boat that takes you over the Gordon River at the southern end of the trail only runs on a limited timetable. I believe the first crossing is at 8:30am, and then again after the first orientation at around 11/11:30am. It then apparently goes back and forth (according to the driver) until 3:30pm or maybe a little later. You would need to time the end of your trip to fit within these times and also consider the bus schedule if you left your car at the other end. 3. Parking at Gordon River trailhead costs $5 a day while the Pachena Bay parking area is free (and a lot safer). 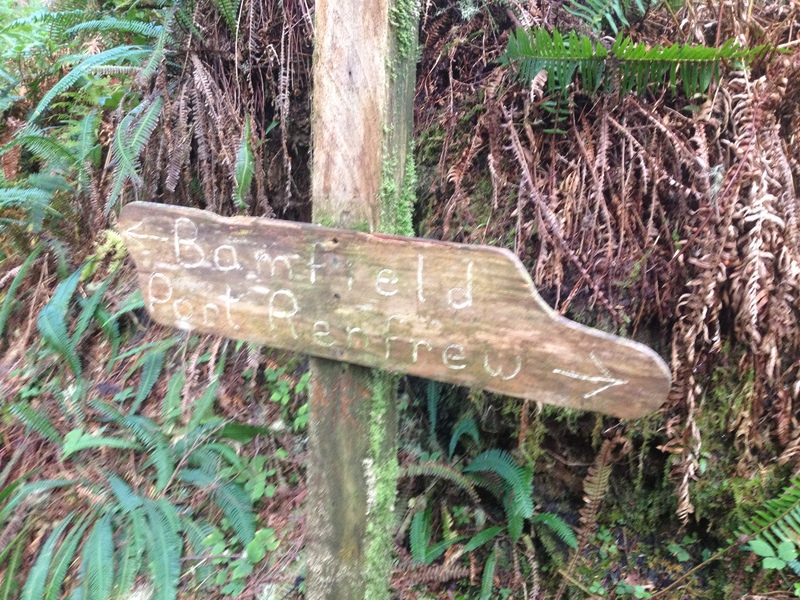 There are 50 available spaces for reserved hikers to begin the trail at either end and 10 spaces for standby hikers. Check out the Parks Canada Reservation page for more details. The permit fee of $184 includes the two ferry crossings but not the bus (which costs $85 per person one way). The trail is often booked out early so ensure you reserve early (bookings open in January for the year). 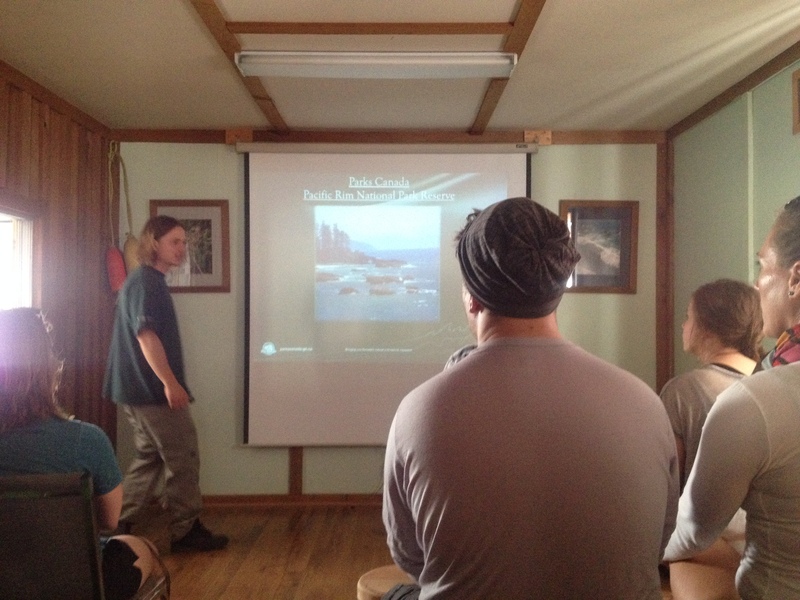 The orientation is a 30-45 minute presentation that covers information about the trail, tides, campsites, water sources, wildlife, weather, safety and emergency procedures. It is compulsory for every hiker and I’m glad they insist upon it. The key message to take away is to concentrate on every step, which is absolutely correct. You will receive your map and tide chart at the orientation. Some people choose to do the orientation the day before so they can start early on their first day, otherwise the earliest you can start is after the 10am session at around 11am. The ferry over Nitinat Narrows runs from 9:30am to 4:30pm whenever hikers are ready to cross. The Crab Shack is on the southern side of the crossing and is a great place to have lunch and eat the freshest seafood you’ve ever tasted. Fresh salmon or crab and a potato costs $25 and they also sell toasted sandwiches, beer, soda and WCT t-shirts. If you’re travelling to the southern trailhead at Gordon River near Port Renfrew you can take the ferry from Tsawwassen (south of Delta) to Swartz Bay (near Victoria). If you’re travelling to the northern trailhead at Pachena Bay near Bamfield you can take the ferry from Horseshoe Bay (West Vancouver) to Departure Bay (Nanaimo). Check out the BC Ferries website for more information. The exact number of ladders could not be quoted to us by either office at the trailhead but I’ve read it’s over 50 and feels like more. A man named Irvin who was working at the Burger Shack (km 44.5) told us there were approximately 2km of ladders on the trail. Some of the ladders are extremely long and steep and require great strength and concentration, especially when wet. One ladder is on an angle and in one section they were rebuilding a ladder so we had to repel down by rope. 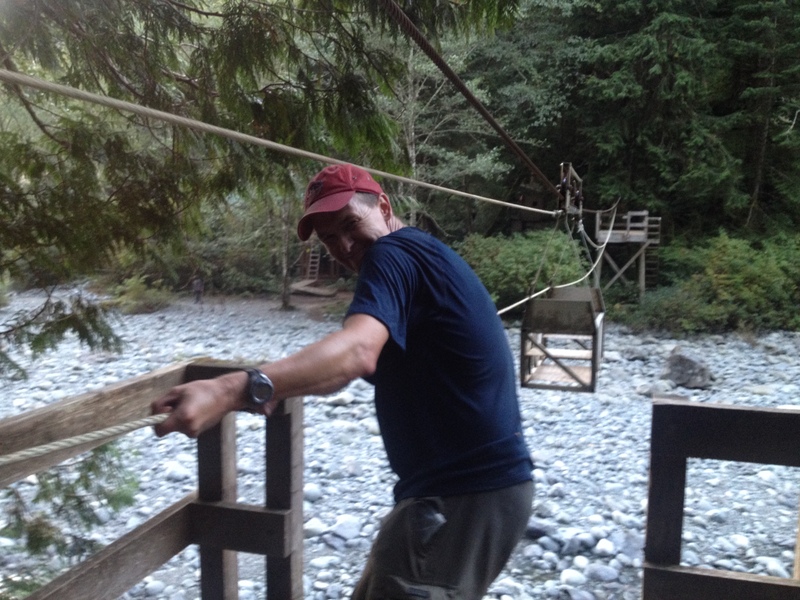 I would not recommend this trail if you are scared of heights or have trouble with balance. It’s terrifying how easy it would be to fall off one of those ladders. There are 5 cable cars on the trail. 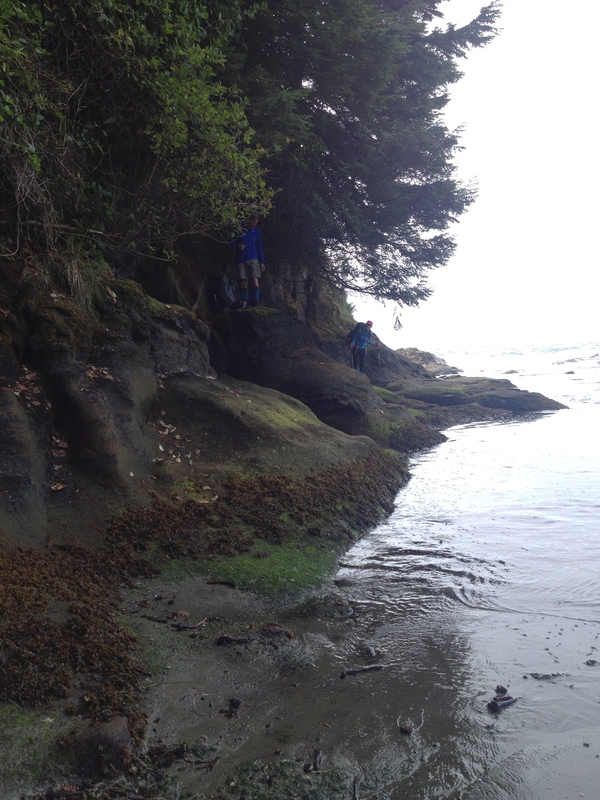 Some can be avoided at low tide if you’re prepared to wade through water but we ended up doing them all. They require strength and gloves would be a good option for hauling the rope. The most difficult one is over Cullite Creek (km 58) because it barely moves at all. Only two people can fit in a cable car (at Klanawa River km 23, it recommends only one). It’s easier if you have someone on one of the platforms pulling the rope while standing as it’s hard to do from inside the cable car. There is a campsite at either end of the trail to camp out the night before or after the trail. We stayed at the Pacheedaht First Nation site by the beach for $20 a site at the southern end which had fresh water and power available plus limited snacks and outhouses. You will be given a tide chart along with a waterproof map of the trail at the orientation. 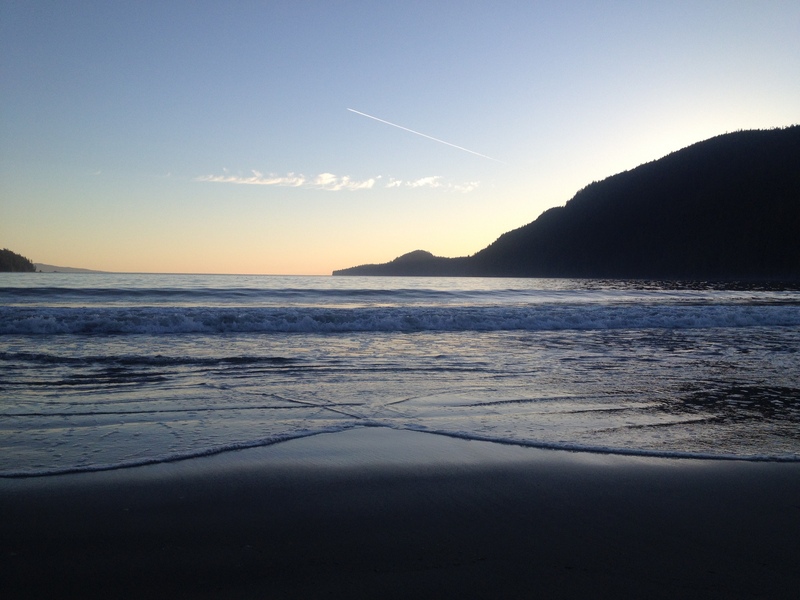 It is easy enough to plan your day around the tides so that you can take full advantage of walking along the beach. Be aware that the tide warnings are very real and even when the tides are low some places are extremely challenging and slippery to pass (especially Owen Point at km 67 and the point at around km 37.7. Most campsites are listed on the maps and all have an outhouse and a bear bin. I highly suggest either hanging your food or using the bear bins (if there is room) as there are LOTS of mice and other creatures in addition to bears who can and will get to your food. Campsites can get extremely busy so it would be advisable to get to your chosen site as early as possible to find a good place to camp. The busiest campsites seem to be Thrasher Cove at km 71, Tsusiat Falls km 25 and Michigan km 12. There are barely any places to camp along the trail (maybe three tiny spots I saw in total) and if you’re camping along the beach outside of the designated campsites you need to be aware of the tides. 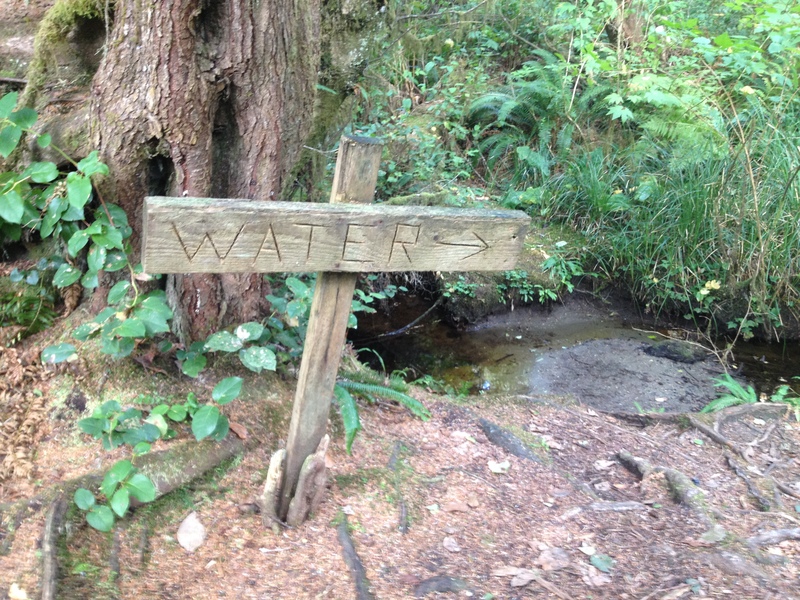 There is an abundance of fresh water on the trail. In the orientation they will tell you there is a 15km stretch with no fresh water sources from km 27 to 42, but this may be because the sources are on native land. You can always purchase water (plus soda & beer with your crab or salmon) at km 32.5 (Nitinat Narrows). I never needed to carry more than 2 litres of water at a time in September. All water from fresh sources should be treated. 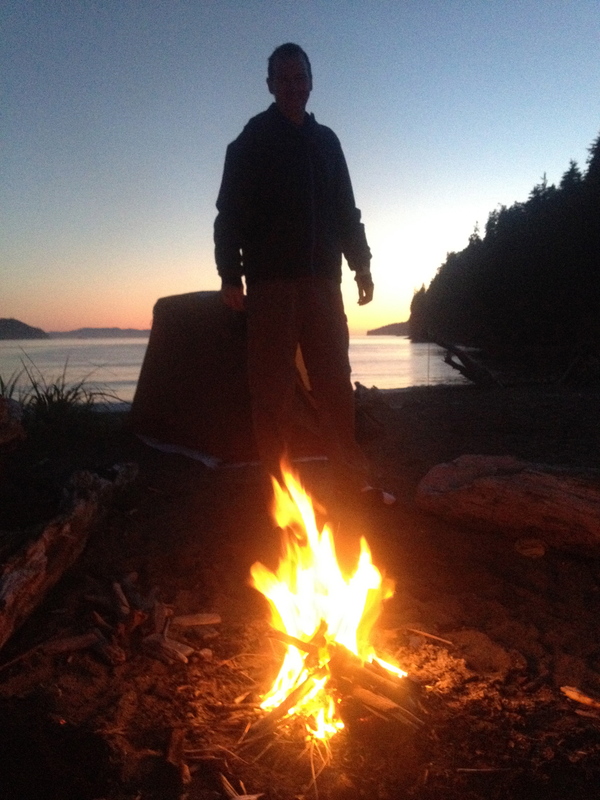 It is legal to have fires on the WCT unless there is a fire ban in place. They suggest building fires below high tide but I didn’t see anyone doing this, plus we even stumbled across a fire that was still lit at a camp site in the afternoon when no one was there. 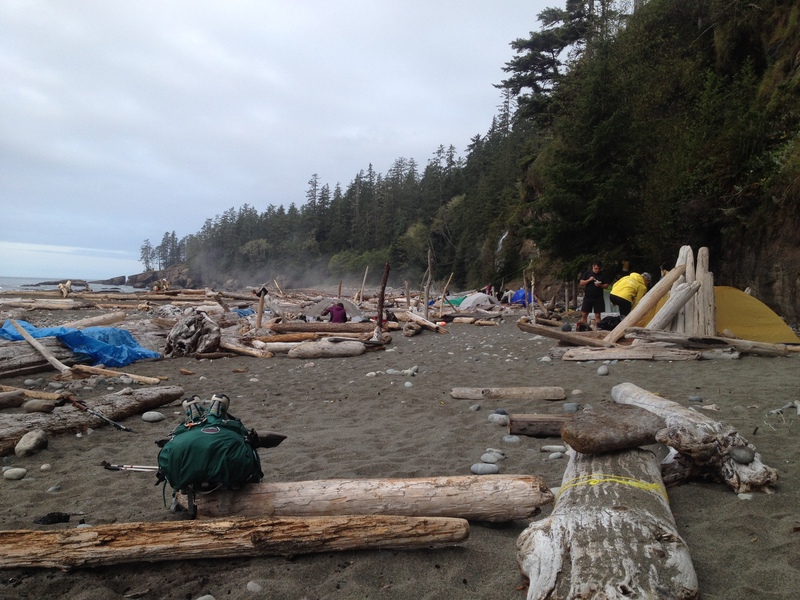 There is plenty of firewood and kindling to be found along the beach. > Be prepared for a hard slog. It’s not an easy trail. Even some of the beach walking is tough when you’re sinking deep into the sand. > Ensure you have a good level of fitness and are physically strong enough to climb with the weight you carry. > Plan your days ahead according to the tide chart and be prepared for kilometres to take longer than you expect. The only time you can walk at a 4km/h pace is between km 2 and 10. > This is not a trail I would enjoy hiking alone. It’s so technical there isn’t much time to let your mind wander and the cable cars would be near impossible on your own. > If you’re physically prepared and the weather is on your side you’ll have a ball. The scenery is unbelievable along the coast. If it’s raining the challenges will be that much harder, and if you’re not in a good physical condition and haven’t done a lot of backpacking with a 40 or more pound pack, I honestly don’t think you’ll enjoy it. 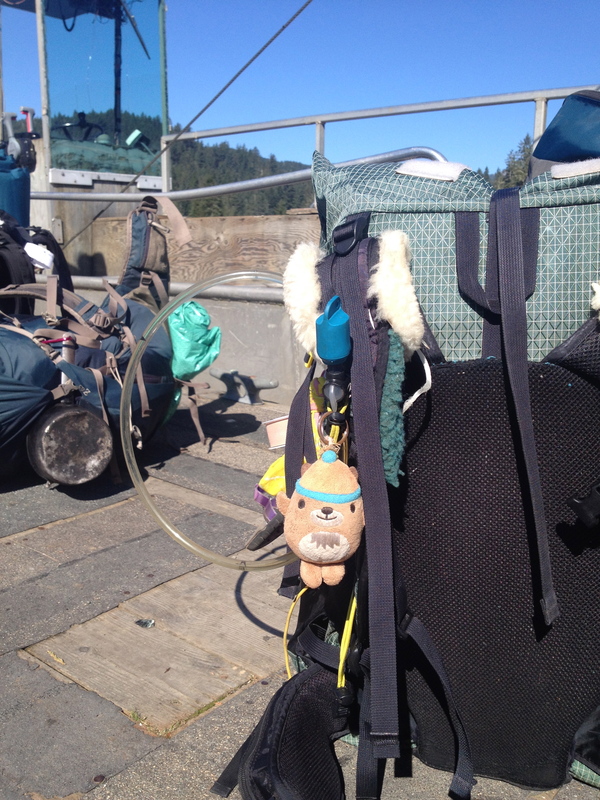 We met three people that were leaving the trail at Nitinat Narrows km32.5 (the only evacuation point on trail).